Latest Kompakt ambient comes from Sebastian Meissner, resident of frankfurt/main. A conceptual artist, composer, sound designer and photographer, presents his latest project "milk&honey", after considered works for labels such as mille plateaux, beta bodega, sub rosa and cronica, reinstalling his klimek guise on kompakt. Meissner's works are mainly concerned with coincidence, which in case of klimek bases itself on the classic analog soundsource: guitar. slow motion soundshapes unfold into boundless width and contemplative silence. pictures, references, associations, predilections rove atop the imagination. "milk & honey" draws on the italian western and the classic roadmovie. 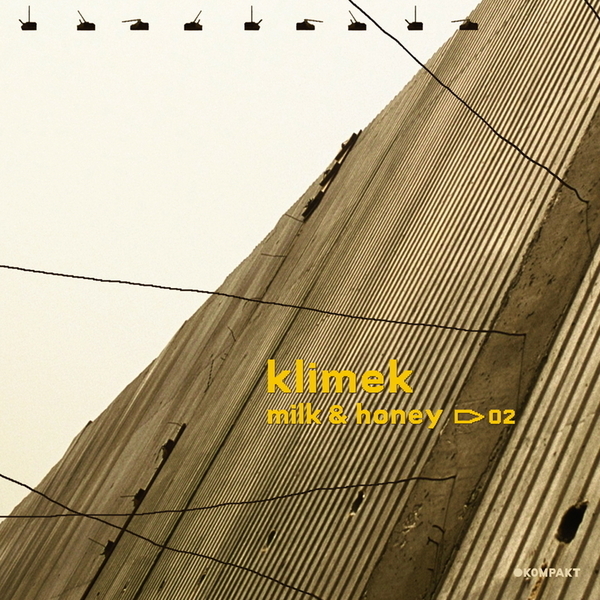 Meissner rather refers to the country where milk and honey flows, which is reflected on the coverartwork and in the quicktime movie contained on the cd version. his photographs also form the raw material for the multimedia installations. this album sounds as if a lonely guitar - scattered to the four winds ˆ escapes the ear. a perfect, suspenseful soundtrack for a sultry thunderstorm. Music for climatic disaster - and quite possibly the most absorbing release on Kompakt yet.